I don’t have a clear memory of when I started practising or when I undertook that first life changing yoga class. I’ve been brought up with yoga, because my mum has been a yogini and yoga teacher for as long as I remember. Often, the assumption is therefore made that I’m super bendy and flexible and that I would make a great yoga teacher. After all, it’s in my genes. But having a yogini mum can have both pros and cons, here’s how my ideas about having a yogini mum have shifted and changed over the years. First of all, I have struggled for a long time with the idea that I’m not flexible enough to be a yogini and/or a yoga teacher. With a super flexible yogini as mum, I had made the image in my head that flexibility is a requirement to be a yoga teacher. You have to be able to demonstrate all of the most advanced (for most of us impossible) poses, and of course you should be at least be more flexible than your average students. I once heard that the more flexible you are in your mind, the more flexible your body will be. Of course yoga is not at all about being able to put your legs around your neck and this is definitely not what my mum is teaching. It is more my own creation of ideas and reflections of how I should be. During my early teenage years I wasn’t rebelling against my parents. Instead, I was more embracing the ideas, hobbies and visions of my mum. My mum was my idol! I was quite serious about spiritualty and yoga and sometimes ‘forgot’ to have fun with friends. Often I would be joining my mum on meditation and yoga workshops. My mum’s yoga was always the best too. At times I did a yoga class with another teacher, but I couldn’t fully enjoy it. I was comparing it too much with my mum’s classes. My mum was always curious how I experienced other teachers. Of course I told her she was the best – which was true for me at that moment. I had my teenage rebellion relatively late – when I was about sixteen. I finally started discovering my own identity. Is yoga something for me or is it my mum’s thing? For a period of time I was done with all those soft yoga poses – I was ready for sport and more intense yoga. I started doing Ashtanga yoga in the mornings. This was not really welcomed by my family, since they heard me jumping in my small attic bedroom early in the morning. I started doing running, rock climbing and purchased a mountain bike. I made new friends and said goodbye to yoga for a while. Though, I could never totally leave behind my yoga mind-set and interest. Even while in hot Africa for a several months, I was still doing my own yoga practice in the heat. My practice supported me while I was challenged by the intense conditions and experiences. When I left my mum’s house to live independently, I tried out different yoga schools in my new city; Kundalini yoga, Ashtanga yoga, Hatha yoga and so on. I could never really find ‘my yoga school’. I was still comparing it with my mum’s classes. Also, I had not much time left in my busy schedule and the classes were expensive. I wasn’t used to pay for yoga classes, since I always could come to my mum’s classes for free. I suddenly realized how lucky I was to have a yoga teacher for a Mum! I continued my rock climbing and African dance lessons which I loved as well. At the same time I felt restless and agitated regularly and I didn’t feel totally settled in my new city, new life and especially in myself. 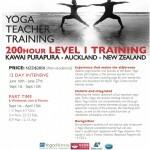 Since my arrival in New Zealand, my love and passion for yoga has grown enormously. Close by where I live, I discovered a wonderful yoga school, The Yoga Sanctuary. Yoga supports me while building up my life in a country far away from family, friends and familiarity. Nowadays, it is hard to imagine my life without yoga. I’ve also just started with a part-time yoga teachers training. It feels so right! It feels if I’m finally going in the direction I’m longing to go in. My mum is happily supporting me on this new adventure. She believes in me, like she always has. I realize how lovely it is to share this yoga journey with my mum. We now share our yoga thoughts, poses and flows with each other. I feel blessed with a mum like her and all what she has taught me and still does. Jacinta is a Holland-born yogini and currently training as a yoga teacher in Auckland. She has completed a Master degree in Health Sciences – including extensive travel to Africa, as well as the Journey Practitioner Programme developed by Brandon Bays. In 2011 she immigrated to New Zealand to be with her Kiwi partner. She loves to share her ideas and write about health, wellbeing and yoga on her blog. 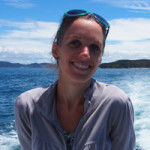 Jacinta is a Holland-born yogini and currently teaching at Yoga Circle in Whangarei: Yoga Circle . She has completed a Master degree in Health Sciences – including extensive travel to Africa, as well as the Journey Practitioner Programme developed by Brandon Bays. In 2011 she immigrated to New Zealand to be with her Kiwi partner. She loves to share her ideas and write about health, wellbeing and yoga on her blog. Thank you for your comment! It is great to realize that other people are on a similar journey and share their experiences. I have an awesome mum as well! So it is hard to be so far away from each other, but for sure it helps me with finding ‘my journey’ or dharma in life. I keep on discovering what my true desires and goals are in life and like you my mum has provided me with wonderful knowledge and experience to deal with life’s challenges. So lovely to see you article here and understand a bit more of your personal experience with yoga! You are one of the persons who make the Yoga Sanctuary a wonderful place to be. You will be missed if you move to Australia.